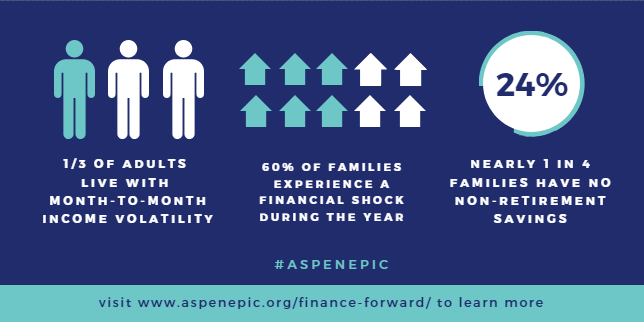 Building off of a 24-month deep dive on income volatility that included a research synthesis and the development of a solutions framework conducted by the Aspen Institute’s Expanding Prosperity Impact Collaborative (Aspen EPIC), Aspen EPIC and LendUp launched Finance Forward. Finance Forward, a multi-city event series, brought together local governments, business, community, and nonprofit leaders to identify and advance innovative, actionable solutions to income volatility and spark a national dialogue that would shine light on the different financial challenges that exist across a geographically and industrially diverse range of U.S. cities. Over eight months, Finance Forward held events on income volatility in three cities, bringing together hundreds of local leaders and community members, spurring a movement that drew commitments and solutions from a range of stakeholders. It’s powerful for the Aspen Institute and LendUp to have brought together so many different forces, because I think income volatility is a big issue and it’s not going to be tackled by one group. I love the fact that Pew and the Urban Institute are here with evidence, and that Aspen and LendUp have also convened local employers and mayors. 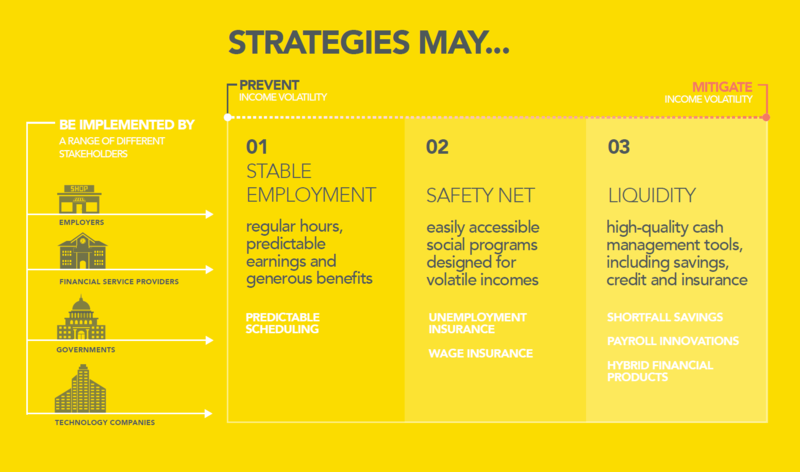 Employers, financial service providers, governments, policymakers, community practitioners – these are some of the actors and institutions Aspen EPIC identified as having the greatest potential for pursuing and implementing strategies that would have a large impact in both preventing and mitigating income volatility. 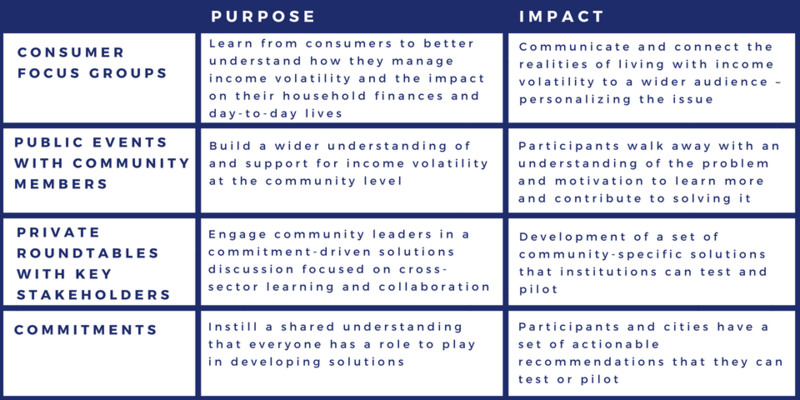 With key stakeholders and change-makers identified, Aspen EPIC developed a solutions framework to map the most effective solutions these different actors could pursue. In building this framework, it became clear that many of the solutions to income volatility could be tackled at the local level. Using the convening strengths of the Aspen Institute as a foundation, Finance Forward structured a four-pronged approach for facilitating dialogue and building momentum in cities across the US. The table below outlines the four components. Each component builds on the other to pull knowledge from a diverse set of individuals and stakeholders, while also being malleable to the unique needs of different cities. Breaking the work into four components provided a framework for extracting as much information as possible regarding the different ways income volatility manifests across communities. In applying this framework, Finance Forward gained new insights about the impacts of income volatility and the kinds of solutions that would be most effective to pursue. Where did finance forward go and why? Is there an elected official who will champion solving for income volatility? Who are the key stakeholders within the community? Does the community have a strong network and high civic engagement? What communications resources will be required to encourage community members to participate in the conversation and/or attend events? Is this an issue that local media has covered previously? What are the best ways to engage local media in this work? *Finance Forward also engaged community members in Lansing, Michigan and New Orleans, Louisiana in this work. In Lansing, Finance Forward held a private roundtable and in New Orleans, conducted focus. Build in the time: Cross-sector collaboration requires time to both build trust across stakeholders and to translate the issue and solutions to different audiences. Lead with local leaders: Empower local leaders to take ownership of the issue and continue to drive solutions forward. Build a local leadership support network: identify which organizations will provide additional support, whether it be with building out an agenda to communications or event logistics. Gather feedback from participants and community members throughout the process: for example, surveying roundtable participants before and after the conversation would help gauge if and how the understanding of income volatility evolved over the course of engaging with the results of the consumer focus groups and/or the roundtable and public events. Keep consumers at the center of the process and discussion: Ensure that you engage consumers impacted by income volatility. Share findings from research (survey and qualitative focus groups or interviews are particularly compelling). Be solution oriented: Create opportunities for both shorter-term programs with measurable impacts and long-term policy-oriented changes to support systemic change.